Bad landlords, bad communication, DWP intimidation. Universal credit strikes again. Dear readers, its been a stressful week for myself however I don’t want to dwell on that, helping people today has ensured that I continue because helping people is the most important thing to me. Thank you to all my friends and colleagues for helping me and being a support. Anyway, coming back to today. The weather was cooler and we had a return of the northern rain, it never fails to do it’s best and we were caught out by it as were the people that we were helping. To make it very clear, we helped and signposted everyone that we spoke to, no one was left in the lurch and we handed six food parcels out to hungry people. Universal Credit and the process of claiming it makes people hungry and depressed and we need to continue to be a support to them, remember this can happen to anyone, no one is immune from this system unless you are rich or are of means. Universal Credit engulfs a person’s life, controls it and makes a person feel as if they have no control over their life anymore. In effect they don’t because if they don’t do as they are told they will be sanctioned and the DWP can withdraw their payments at any given time whether it be a computer glitch, a transfer over to Universal Credit or a sanction. The threat is there and all too real. As soon as I arrived this morning Roy was already there having a conversation with a lady that I hadn’t seen before. She told me that upon applying for Universal Credit she had been advised that there was no sickness element within the Universal Credit framework. Luckily she knew that this wasn’t the case so she appealed this decision and won. She stated that they were nothing but a ‘bunch of liars, and they push you from pillar to post’. To be honest, this isn’t unusual but it shouldn’t be happening at all. Her main problem today concerned a bad private landlord. She wanted to know if she could complain, and where to complain. Luckily a colleague of mine, a local councillor friend had a contact and found out straight away. Her list of complaints concerning her landlord was a long one and no one should have to live like that. However with the absence of social housing people have no choice to choose this option and rogue landlords know this and take full advantage of this. Her list consists of, the landlord refusing to do repairs, no electricity in the kitchen, mail tampering due to a communal mail area, damp living conditions, an infestation of rats and mice and a landlord that can let themselves in her home at any time they like. This is how thousands of people are forced to live, mix this with the uncertainty of tenure its a complete nightmare. She was given details of how to make an official complaint and who to contact. I spoke to a woman that had just been made redundant, she was very nervous, had never been through the process before and is scared of going hungry. We advised her, gave her a survival guide and let her know that we are here to help her. I spoke briefly to an older bemused lady. It was her first time visiting the Jobcentre, she had never been through the system before and had worked all her life. She hasn’t a clue how to use a computer and she’s struggling to understand it all. In the past she would have been enjoying her pension, now she’s being tormented by the DWP and made to jump through constant, moving hoops. We had an interesting conversation with a woman that wanted to share her sons experience of claiming Universal Credit with us. Her son had been working abroad in a European country for a few years, a zero hour contract with no chance of a permanent hours being given. His job sadly ended so he returned home and applied for Universal Credit. He was turned down at first because he was told that he couldn’t apply if he had been working abroad. Luckily he knew his rights and appealed this decision and won. Claiming Universal Credit is often complicated, conflicting advice given, and appealing against any decision is very important. Don’t just take the DWP’s word for it, appeal and complain, you have the legal right to do so. 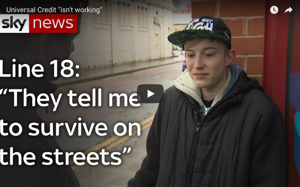 I spoke to a man leaving the Jobcentre. He muttered that he was ok, but being met by 5 DWP members of staff at the front desk was very intimidating. They asked him for proof of appointment, but did it in a way that could have made him feel anxious if he was so inclined. There’s no need at all for so many staff to be ‘guarding’ the doors. 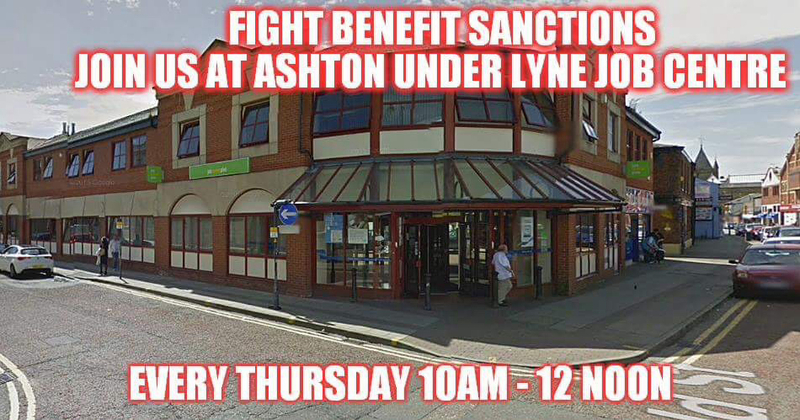 Maybe they are guarding the building against us, but we’ve never caused them a problem and Ashton Under Lyne Jobcentre likes to over react at times. Kudos to the advisors working there that may have thought this to be ridiculous also. We spoke to an older lady that complained about the cost of public transport. She has no choice but to rely on buses for transport, she lives miles away at the top end of Stalybridge, is older and not in good health. She wasn’t one of the lucky few to have been given a bus pass through Andy Burnhams scheme, so she has to pay full price. When you have nothing, bus fare can mean the difference between eating and surviving or not doing so. Bus fare is essential, buses shouldn’t be expensive and they should be regulated by the local authority. In the meantime people are suffering and to be honest it’s simply not acceptable is it. This all happened within two hours, we tackled lots of differing problems and helped with them also. We do a lot of work, and we all do this on a voluntary basis because we want to help, we can’t abide suffering of any kind and we want the system to change. Come and join us one week we would welcome you with open arms. Please read, share, email and talk about this blog. Be a friend to someone because being lonely is awful, and poverty isolates you. Talking is important. Many thanks to everyone that came along and helped, you keep me going. Thank you Lorraine for helping even though I know that you aren’t well. A huge thank you to everyone that reads and supports my blog and my work. Thank you so much. Photo taken at a previous demo. No internet, don’t know how to use a computer, risk being sanctioned. Non payment of Universal Credit on promised date and no reponse to communication efforts. DWP system fails again. Forced to travel miles to attend a DWP mandatory course. Five month wait for Universal Credit payment. The system isn’t working.. I have said for a while that the DWP are corrupt and UC shows just how corrupt they are. If there was legal aid for all cases where people didn’t have the money to make claims then the courts would be full of DWP cases, and many of them I am sure the DWP would lose. On top of that, the DWP will never learn until they are told to pay 8 or £900,000 plus compensation claims that they cannot count as savings for the person who wins, and a double payment if they appeal and lose. These are the sorts of figures the DWP would think twice about if courts started saying payments of around the million pound mark in compensation or nearly two million if they lost the appeal. These thousand pound awards are BS when you think they think nothing of paying the odd couple of thousand to those who really push claims.